angolotti Archives - What the Forks for Dinner? Some of the last things to come out of your garden……should you chose to grow one…….is squash, like butternut, acorn, spaghetti ……….the ones with hard shells. They just spell fall. They are so good roasted and roasting requires an oven, and let’s get real who wants to turn on your oven in the summer…….not me!!! But, when sunset starts coming earlier and earlier and the air starts to cool, I get the itch to turn on the oven. Baking cookies, casseroles, bread, and of course roasted squash. I had to buy my squash 🙁 sad face……..mine did not grow…….it was a garden failure. But, thank goodness that was only me, and other gardeners were happy to sell theirs at Farmers Markets. After my sugar coma from the Chocolate Drop Cookies, I wanted something not sweet and waaaaayyyyyyyy more healthy! Lots of veggies……..hearty, and super tasty. My inspiration in venturing into the blog world was Lindsay and Bojork from Pinch of Yum. Check out their blog……it is truly awesome!!! 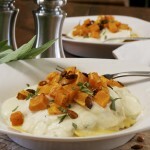 The Creamy Cauliflower Sauce recipe is from Pinch of Yum and boy is it yum!!!! 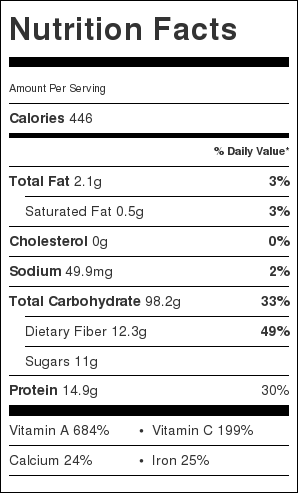 Best part, it’s has no cream and is still creamy……go figure. It was the perfect sauce for this dish. Tim and I are huge fans of pasta…….all kinds. 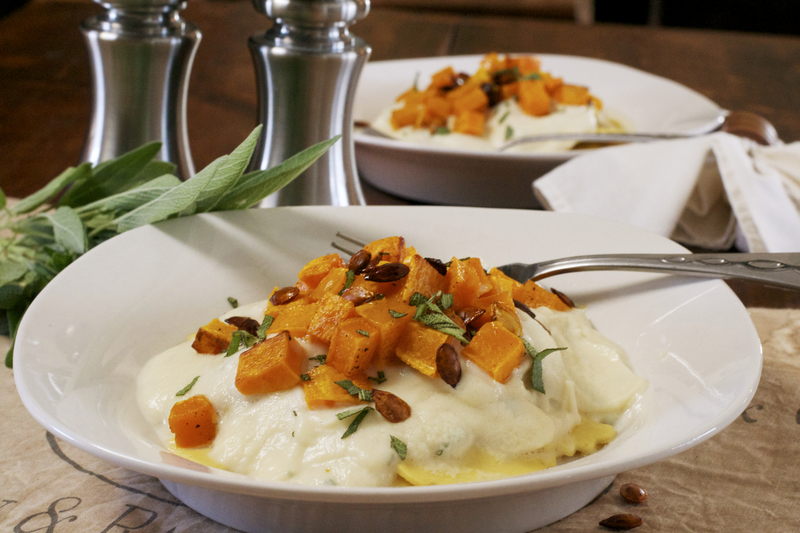 The fresh kind they sell these days at the grocery stores are great.The folks at Buitoni make a Butternut Squash Stuffed Angolotti that is out of this world and even better topped with the Creamy Cauliflower Sauce, roasted butternut squash, and a touch of sage. So I will be honest, peeling squash is not the easiest thing to do, but if you peel it before you cut it in half, it is a bit easier. I use a veggie peeler…..that way if it slips I will only cut the skin off a knuckle instead of removing a finger……Ok thats only funny in hind site….ha ha! 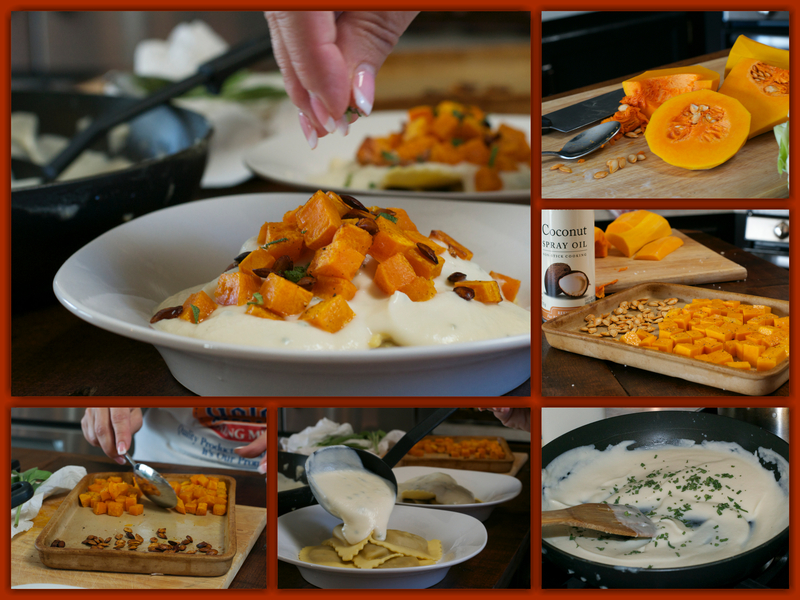 I wanted to have a garnish and figured if you could eat pumpkin seeds, you could eat butternut squash seeds. I did look it up to be sure, just my luck they would be toxic. But they are safe. So, I roasted the squash and the seeds in the same pan. Just watch the seeds so they don’t burn. They do not need as long as the squash to cook. I wish mine had had a few more seeds, they were really tasty. This is not a super quick recipe, but it makes an elegant presentation and the combination of flavors is……….. rich and indulgent, but still good for you……..how can it be, but it is……the whole dish is under 500 calories and low fat. I still find it amazing that the sauce is sooo creamy ……..I’m looking for ways to use it again…..and again……and again!!! !